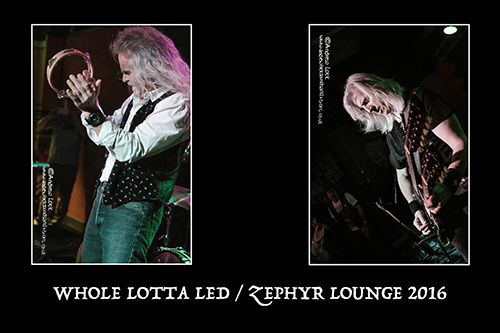 Making a welcome return to the Zephyr Lounge here in Leamington Spa on Saturday 11th March are top Led Zeppelin tribute band Whole Lotta Led who last February played the venue as part of their 20th Anniversary Tour and a belter it was as well. The 5 piece band (even more Zepp for your money !) are all die hard fans of this most classic of classic rock bands which really comes across throughout their performance and this along with their fine musicianship and stage craft puts them up there with the best tribute bands I have seen (and I have seen a good few). Think of your favourite Led Zepp tunes and the odds are they will play it during their mammoth set (nearly 2 and a half hours last year) and they are also not afraid to throw in a couple of the bands lesser known numbers for the mega fans (which includes myself). Among the numerous standouts for me during last years show a majestic ‘Ramble On‘ the brace of rockers that should always be performed together (as of course on Led Zeppelin II) ’Heartbreaker’ and ‘Living Loving Maid (She’s Just a Woman)’ and an epic ‘Stairway To Heaven’. Last years gig was my introduction to the band and instantly put them on my personal list of top tribute acts, so if you want a great night brim full of classics made famous by possibly the most iconic rock band of all time played by fellow fans who also happen to be top rate musicians maybe this is for you.